Why Collingwood’s 2013 Campaign Was The Best I’ve Seen Lately. 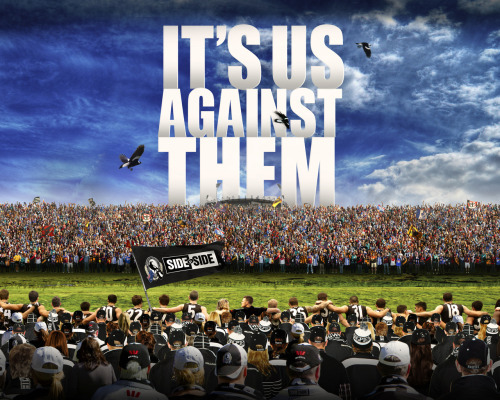 I am absolutely in love with Collingwood’s 2013 ad campaign: It’s Us Against Them. Seriously – falling all over myself about it. I remember seeing the ad (not the commercial – I don’t think it airs in New South Wales?) when it came out at the start of the season and I remember thinking, “That’s really catchy…” but that’s not the only reason I like it. I like it because it’s relevant. Do you want to know the first thing my friends said when we were talking about the ad? They said (including the lone Collingwood supporter), “At least they realize it.” You see, what I gather is that people don’t like Collingwood (by people I mean non-members and me… I bear them no ill will) and when I say ‘don’t like’ I mean they REALLY don’t like Collingwood. So in reality, it is them against everyone else. How great is it when you see an ad, and everyone agrees? It doesn’t even take convincing because it already perfectly describes how everyone, including the opposition, feels. Perfect. I like it because it unites the fans. This ad draws a line in the sand that says you’re either with them or against them. That’s a great technique to make fans feel united. They don’t just feel connected to each other but also to the club, because usually you’d said “Collingwood against [enter name of other team here]” when talking about a game. They’ve made that a whole lot bigger. Now, I’m not saying that they’re all suddenly going to be best friends but isn’t the idea of supporting a sports team that you get to be part of something bigger than yourself? This campaign does just that. I like it because it’s memorable. Like I said, this is a catchy slogan. People are going to remember it – and in a positive way, not like Essendon’s ‘Whatever It Takes’ campaign this year (which, it feels like they basically gave up on after the whole drug scandal…). I’m a big fan of haaving a different theme each year, but I also don’t see the point in changing this one any time soon. Seriously – I don’t think Collingwood could have come up with a more fitting campaign. Good work team. ← How Ari Gold Made Me The Best Future-CEO Ever.